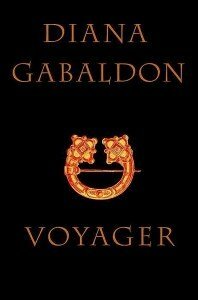 Finished reading Voyager (Outlander, Book 3) by Diana Gabaldon. In Voyager Gabaldon continues the Outlander saga of 20th-century physician Claire Randall and 18th-century rebel Jamie Fraser. The book begins 20 years after the last book left off. Jamie is imprisoned, and once he’s pardoned he buys a printing business. Believing that Jamie died at Culloden, Claire returns to her own century. She is reunited with her first husband and gives birth to a daughter, Brianna. When Claire’s first husband’s dies she takes Brianna to Scotland to introduce her to her true heritage. After some research they discover that Jamie survived the battle at Culloden. Claire decides she must find Jamie and once again steps through the stones on Craigh na Dun to find Jamie in Edinburgh in 1766. Once reunited Jamie and Claire want to lead a quiet life, but the kidnapping of Jamie’s nephew throws the couple into a new pursuit. I enjoyed Voyager as much as I enjoyed the other books in the Outlander Series. I’ve already started the Drums of Autumn the 4th book in the series.